APRIL 2019 UPDATE: Due to ongoing legal disputes regarding owners that arrange rentals independently, our suite is not available for short-term rentals at this time. Please contact the owner should you be interested in a long-term rental (30 days or longer). THE TURQUOISE GRAND... An exclusive SIGNATURE CLUB Luxury Vacation Suite at THE REGENT GRAND... You are assured of an exceptional Ocean Front corner suite with incredible views and many included premium features such as Platinum HD Cable with 150+ channels, the highest Internet speed available, and free international long distance... GUARANTEED! 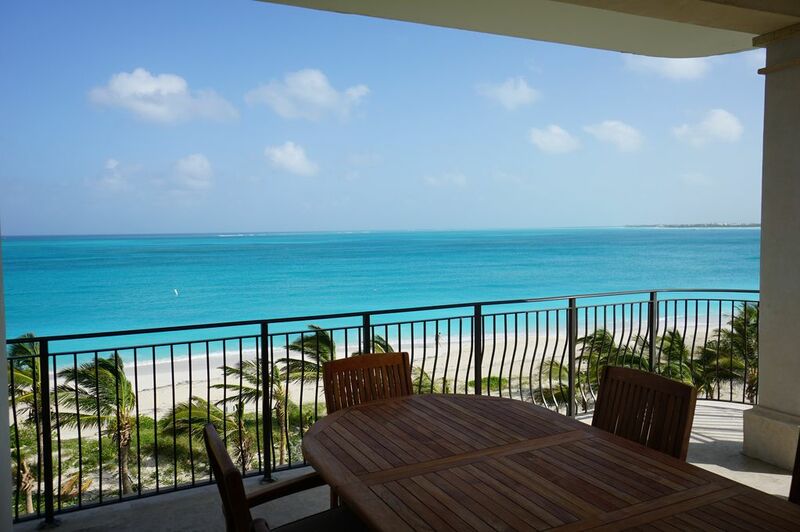 We respond to rental inquiries for The Turquoise Grand Suite through our VRBO/HomeAway dashboard. If you receive an email from anyone claiming to be the owner of the condo with listing number 200480 and the email did not come through the VRBO/HomeAway system, please make sure you were expecting an email from that sender and that you have confirmed that you are dealing with the owner. Also, please note that we always provide our phone number in Atlanta and other contact information before requiring any type of booking deposit. We also accept rental payments via HomeAway Payments, the most secure payment method for peace of mind. Come and see why Conde Nast Magazine has rated Grace Bay Beach on Providenciales (“Provo”) as one of the finest in the world. It is a beach lover's dream with 12 miles of white, powdery sand beaches, sparkling turquoise waters, cerulean skies, and dramatic sunsets. The Turks and Caicos Islands are surrounded by the world's third largest coral reef, and the snorkeling and scuba diving are some of the best in the world. The Regent Grand is one of Provo’s newest and most luxurious residential condominium resort, secluded on more than 4 acres with over 300 ft. of Grace Bay beachfront. Guests can enjoy an early morning workout in the fitness center located in the pavilion building or play a late afternoon game of tennis on the floodlit championship court. A palm-tree lined boardwalk leads from the oceanfront building to a stunning beach, with complimentary towels, chaises, and umbrellas. The resort is ideal for couples, families, golfers, and divers alike. The resort’s central location in the heart of Grace Bay makes it the perfect vacation destination. Just outside the resort grounds, guests can find restaurants (both elegant and casual), gourmet grocery store, shops, art galleries, designer boutiques, liquor stores, and the full-service Teona spa. Two excellent dive operators are within a few minutes walking distance, as are bicycle rentals and car rental offices. By rental car or island taxi, guests can reach the Casablanca Casino or the Provo Golf and Country Club (voted one of the finest golf courses in the Caribbean), both within a few miles of the resort. * The Turquoise Grand is a spacious fourth-floor corner beachfront residence with expansive wrap-around terrace and 2,380 sf of luxurious living space. From the terrace as well as the kitchen, dining room, living room, and master bedroom, the suite boasts stunning views of the calm turquoise waters of Grace Bay. * Outdoor terrace furniture includes solid teak dining table and chairs (seating for 6) plus 3 chaise loungers facing the ocean. The Regent Grand resort is located on the island of Providenciales in the Turks and Caicos Islands, British West Indies. Provo is less than 600 miles southeast of Miami, and getting there is easy. In fact, it's one of the most convenient destinations to fly to in the Caribbean. American Airlines, Delta Airlines, US Airways, Jet Blue, Air Canada, British Airways, Air Jamaica, and Bahamas Air are among the airlines that currently offer service. TCI is a British Overseas Territory, English is the official language, and it is in the Eastern time zone. The U.S. dollar is the official currency, and electricity is U.S./Canada standard 110V/60Hz. We live in Atlanta and vacation to TCI several times a year. When we first visited TCI in 2005, we were hooked by the incredible beaches, water, and how low key and uncrowded the island still is. On our second visit in 2006 we visited all the resorts looking to purchase our own 'litte piece of paradise,' and we found The Regent Grand far and away the most beautiful and best located resort on Provo. The resort was designed and built by the most experienced developer on the island with a commitment to absolute quality, and the resort is managed today by the friendliest most professional staff of any resort in the country. We also love how easy it is to visit TCI for short or long vacations. Only 1-1/2 hours from Miami, 2-1/2 hours from Atlanta or Charlotte, and 3 hours from New York or Toronto. You arrive at the resort and can be on the beach 30 minutes after your flight lands, making the first day of your trip nearly a full day of vacation instead of travel. The suite has so much to offer that we always hate leaving. The terrace gives you all the sights and sounds of Grace Bay but also protects you from the afternoon sun, so many days we spend part of the afternoon on the terrace just enjoying the views - especially the sweeping panorama view to the East, up Grace Bay all the way to Leeward. As one of the few East corner units with this view, we are truly lucky. At night or on rainy days, we love using the games and picking a selection from our extensive video library (160+ DVDs) stored in the drawers in BR3. When we need to catch up on work at home, we bring our laptops with us and can use the excellent password-protected WiFi signal anywhere in the suite. We mix up our lunch/dinner plans each day between visiting one of the many wonderful restaurants within walking distance vs. staying in to cook a wonderful meal with all the modern appliances, pots, and utensis in our kitchen. We can dine in at the long teak dining table (seating for 8) or dine on the terrace on the beautiful teak table (seating for 6). Conveniently located walking distance from Regent Village, Salt Mills, Ports of Call, and other retail districts including shops, bars, and restaurants. Beautiful beachfront views to the East, North, and West of Grace Bay and the beach. Vonage VoIP service for free local and international long distance calling. Also, an incoming toll-free phone number for callers in U.S./Canada to reach you. Two high efficiency A/C units plus ceiling fans in each room keep the suite comfortable even on the warmest days. Heating is not necessary on Provo! High thread count cotton linens; soft down or synthetic pillows; plush cotton bath towels and robes; hair dryers in each bathroon. Free, secured wired and Free WiFi Internet service for complimentary use by our guests. Pool area also has Free WiFi - ask the front desk for details. Plenty of white bath, face, and hand towels are supplied in the condo. Ask at front desk for yellow towels for use at pool and beach. Fully equipped exercise facility with treadmills, Nautilus weight machines, free weights, etc. Beachfront building has East, Central, and West elevators so you rarely have to wait for a ride up or down on the East end, where our condo is located. Stainless steel side by side with filtered water dispenser and ice maker. 12-cup drip coffer maker (basket filters). We suggest bringing in your own coffee grounds, as coffee on the island is quite expensive. Guests may find salt & pepper, sugar/Splenda, some spices, but overall we have the pantry cleaned out after each guest visit, so you may want to bring down non-perishable items, esp. coffee. Fully equipped with stainless steel professional quality applances including refrigerator, 42 bottle wine chiller, microwave, oven and range, dishwasher, toaster, coffee maker, and blender. Two high chairs are stored in the closet in Bedroom 3. (4) TVs in living room and each bedroom are subscribed to all premium cable TV channels, and the living room cable box has DVR box for pausing/recording. Living room has a full entertainment system. Each bedroom has an iHome FM Clock Radio with USB Charging Port and Bluetooth connectivity for you to play music directly from your smartphone or tablet. More than 40 assorted Caribbean, tropical, salsa, and smooth jazz music CDs. Our suite has its own video library with a wide variety of more than 160 popular DVDs - probably the largest private DVD library on the island, exclusively for the use of our guests only. The resort has its own tennis court. We have four rackets in the suite exclusively for our guests' use. Excellent golf is close by at Provo Golf Club. The resort boasts the most beautiul mosaic tile infinity edge swimming pool on the island, with super comfortable loungers all around the pool. One of only two heated resort pools on Provo. Everything was perfect. The weather, the water, this condo and the resort. Even during a busy week, the entire island, especially the resort, was uncrowded. It was amazing. We traveled with our 3 kids, 17, 15, and 13 and we all agree this is our favorite vacation ever. The condo is beautiful, clean, spacious and beyond expectation. We could walk almost everywhere we wanted to go (shops, grocery, and restaurants). We did go on a snorkel excursion and the company picked us up at the resort. We also went parasailing and the boat picked us up on the beach. The owners were so great to work with before and during our stay. The dishwasher power button went out and the owner and a brand new dishwasher installed within 2 hours! We were amazed. We hope to stay there again soon! Well run with very responsive host. The condo provided everything you could ask for and more. Thank you! The location is fantastic. The only confusing thing is the transition going on at the resort. Loved our stay at this beautiful condo. Location is fantastic. Truly, paradise. The owner, Bruce was very accommodating and the condo along with property was very well cared for. The condo is luxurious amd completely upgraded. Also, is the best location on the island. Everything was absolutely perfect! The apartment was luxuriously appointed with everything you can think imaginable. The views are stunning, and we had great weather while we were here. A wonderful family vacation for us. LOCATION: The Regent Grand resort is located on the island of Providenciales in the Turks and Caicos Islands, British West Indies. Provo is less than 600 miles southeast of Miami, and getting there is easy. In fact, it's one of the most convenient destinations to fly to in the Caribbean. American Airlines, Delta Airlines, US Airways, Air Canada, WestJet, JetBlue, British Airways, Air Jamaica, Bahamas Air, and Sky King are among the airlines that currently offer service. TCI is a British Overseas Territory, English is the official language, and it is in the Eastern time zone. The U.S. dollar is the official currency, and electricity is U.S./Canada standard 110V/60Hz. * Rates shown are for groups of up to 6. * Upon request, owner may approve 7th guest if infant or toddler age subject to $50/nt surcharge. * 25% deposit confirms your booking, fully refundable until 60 days prior. * To book and pay via credit card - click on * REQUEST TO BOOK * * For further information - click on * ASK OWNER A QUESTION * * Rental deposit represents 28% of the rental charges. The balance due 60 days before arrival reflects the remaining 72% of the rental charges plus the full 12% government tax on the total amount of rental charges. No government tax is included in the rental deposit.